I received an email today from my friend David Knapp ’49 who tells me he is participating in Wesleyan’s Week of Service by reading to a group of first grade students in New Haven tomorrow. This reminded me of all the great things students, faculty, staff and alumni are doing in support of their communities. 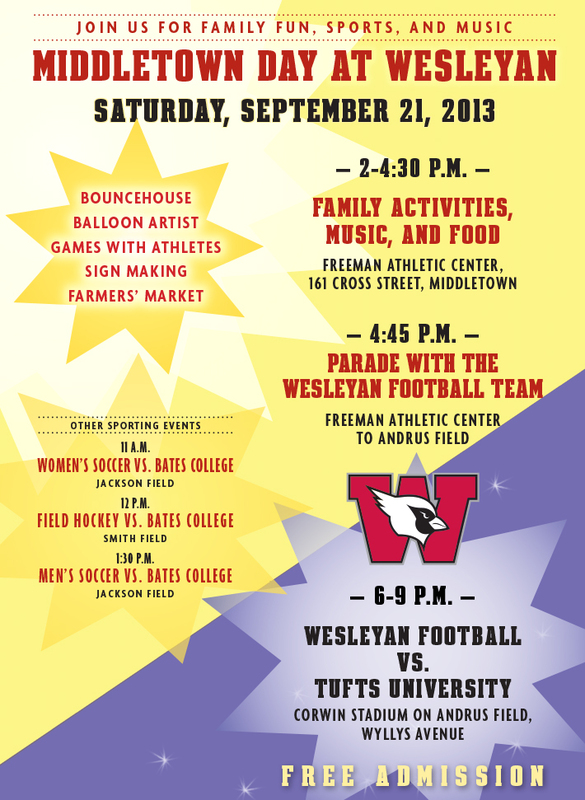 Of course, the Wesleyan engagement isn’t confined to one week. The Patricelli Center for Social Entrepreneurship, to take just one example, has seed grants that are offered on a competitive basis. Applications are due this week and you can find out more here. Information on Davis Projects for Peace Grants (all students are eligible; applications due 1/25) can be found at that same link. And here’s a link to photographs of Wes folks joyfully participating in community service activities. 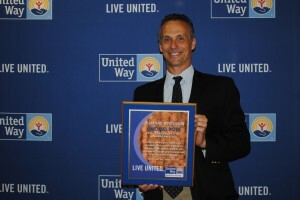 The United Way campaign, which raised $111,000 for the community. The Center for Community Partnership’s upcoming High School Humanities program, which brings 80 local students to campus to hear faculty lectures. 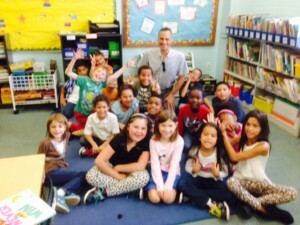 Green Street’s Discovery AfterSchool program for local children, and Intel Math Institute, which provides intensive professional development for public school teachers from Meriden and Middletown. 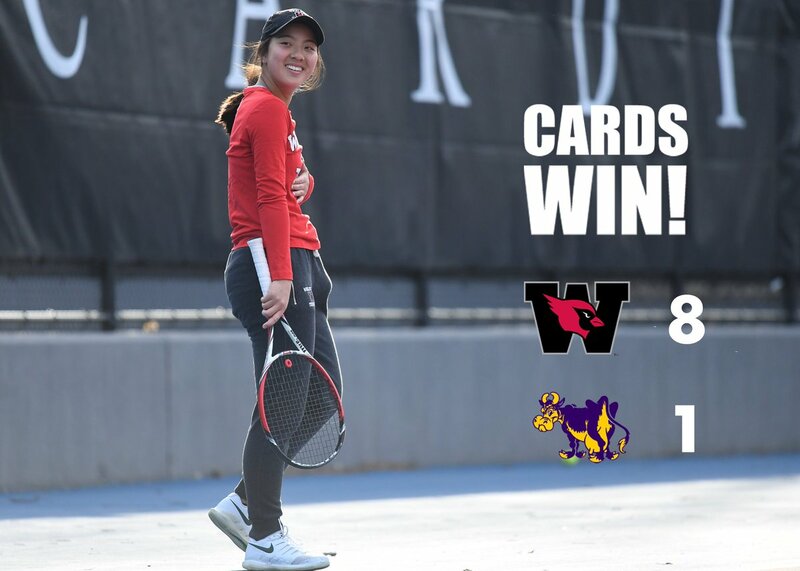 And the Office of Community Service’s support of over 600 students each semester doing volunteer work locally. I took the above from Wesleyan news article on engagement. To stay informed about all civic engagement opportunities at Wesleyan, email scapron@wesleyan.edu to sign up for the weekly ENGAGE newsletter. 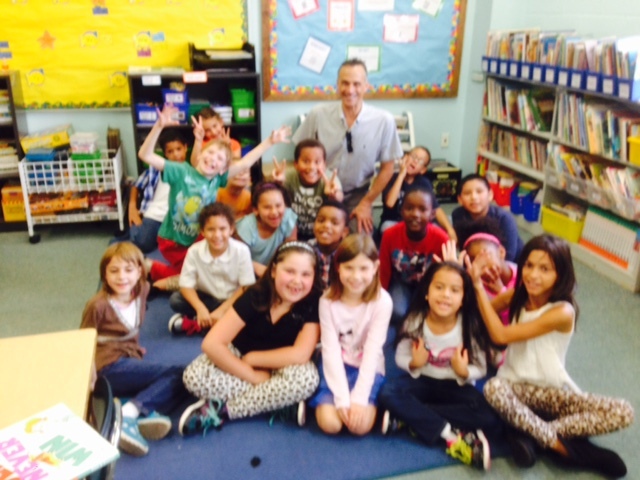 Yesterday I went to Middletown’s Macdonough Elementary School to read to second graders. 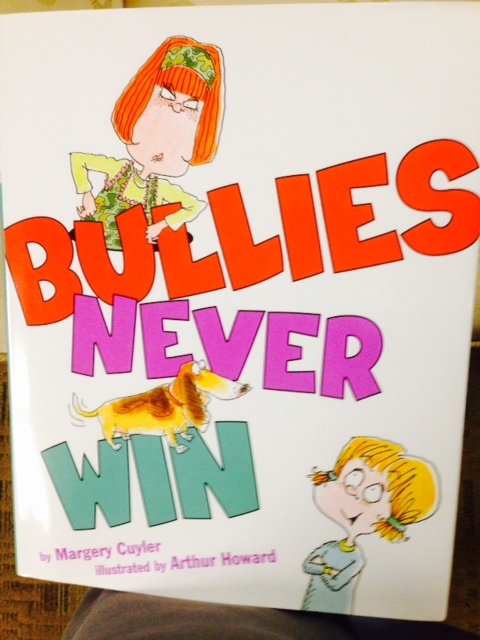 It’s anti-bullying month, and I was to share Margery Cuyler’s and Arthur Howard’s Bullies Never Win. When I arrived at the school in the North End, I immediately noticed the sign-in sheet for Wesleyan people in the principal’s office. It was a long list of volunteers. I already knew that Wes students devote hundreds of hours to working with the boys and girls at Macdonough, but it was still a fine surprise to see how many were there just that day. As I walked to my classroom, I saw football players and musicians, activists and scholars…all taking time away from campus to improve the experience of these local kids. The class I read to was attentive and curious. Who was this old guy who had come to read to them? When I was introduced, a boy from the back of the room asked in an awestruck voice: “Are you president of the whole country?” Everybody giggled as I began to explain — he was just kidding around. I read the story to them, and we had a great discussion about why bullying was wrong — and how you could ask for help without being a “tattle tale.” As I left, I saw those same Wes students still tutoring their kids…making a real difference right here in Middletown. How lucky I am to be part of their schooling. This weekend The Center for African American Studies and the Allbritton Center for the Study of Public Life have put together an extraordinary celebration and commemoration of the 50th anniversary of the “freedom summer” of 1964. That year student activists from across the country headed south to work with African Americans in the struggle for civil rights. Others supported that work by organizing protests or doing important logistical tasks, often outside the spotlight. Alliances across religious affiliation, ethnicity, gender and race were key components of that heady time. There were tensions, to be sure, but there was also compassionate solidarity to “bend the arc of history” toward justice. Wesleyan students, faculty and staff, along with other Middletown residents, were very much engaged in those efforts. Churches played a crucial role here as they did in the south. And music was everywhere linked to this work. So it’s fitting that our freedom summer celebration begins Friday with a “rolling concert” at 6 p.m. (100 Cross Street) featuring choirs from AME Zion Church, Middletown High School and Wesleyan. Dar Williams ’89 and Kim and Reggie Harris will be featured Friday evening, along with a children’s choir. The symposium gets underway Saturday afternoon. In 1964 many in the Wesleyan community joined with a movement to work for the principles like the right to vote and equal protection under the law. These principles are under enormous pressure once again. As we celebrate 1964, may we be inspired to take up today’s challenges. Thanks to Lois Brown, Rob Rosenthal and everyone who helped make this event happen. Wesleyan Special Collections and Archives: “Civil Rights Activism and Wesleyan” An exhibit featuring historic Civil Rights-era Wesleyan materials, documents, and photographs. The editors of the Huffingtonpost asked me for my reactions to the announcement that Rick Levin was stepping down as president of Yale. Here’s what they have posted. The news of Rick Levin’s retirement as president of Yale surprised me. True, the tenures of university presidents are notoriously short, and the dangers of burnout are great for even the most well trained administrators. But Levin was the great exception. He’d been President at Yale for 20 years, and he had been a graduate student and professor there for about the same length of time. Given the new initiatives we’ve heard coming out of New Haven, I had no reason to think change was in the air. But it’s certainly the case that Levin has more than earned his “retreat rights” to teaching and writing. Levin has steered Yale through a period of dramatic changes in American higher education, and he has done so in ways that have made the University stronger than ever before. Many others will assess the Levin years in regard to the shaping of the curriculum, the stature of the professional and graduate programs, and the dramatic expansion of the campus. There will surely be extended considerations of his efforts to make Yale a more responsible partner to educational and civic ventures locally, nationally and internationally. Yale’s work with the New Haven school district and with the local community college is a model for many schools. The New Haven Promise Program, which funds college scholarships for all New Haven high school graduates earning a B average, completing 40 hours of public service during high school, and maintaining 90% attendance, is a great example of what a financially strong institution can accomplish locally. Levin’s participation in the national conversation about science education and his devotion to creating more financial aid opportunities have made a significant impact on higher education in America. As a strong leader of a powerful institution Levin has surrounded himself with good people who have become distinguished leaders themselves. Several Yale faculty have gone on to become successful deans and then on to distinguished presidencies across the country. As I know from experience, hiring a senior administrator from Yale means hiring someone of high integrity who can quickly make a difference through leadership and teamwork. Levin has long championed international partnerships, and it is in this area that his recent efforts have been controversial on the Yale campus. The university’s collaboration with the National University of Singapore will be an important experiment in developing the liberal arts outside of the United States. The Yale faculty, and many of us who care deeply about liberal learning, wonder how an educational project can advance in a political context that punishes ways of thinking and living that have been vital dimensions of scholarship. Will the university be corrupted by these oppressive tendencies, or will the university help create currents of thoughtful change? Levin and Yale have clearly bet on the latter. What would it say about the depth of our faith in education to bet on the former? I’m no expert on Yale or on the Levin presidency. I’ve met Levin just a couple of times, even though my own university is just a short drive north of New Haven. But I’ll end on a personal note. 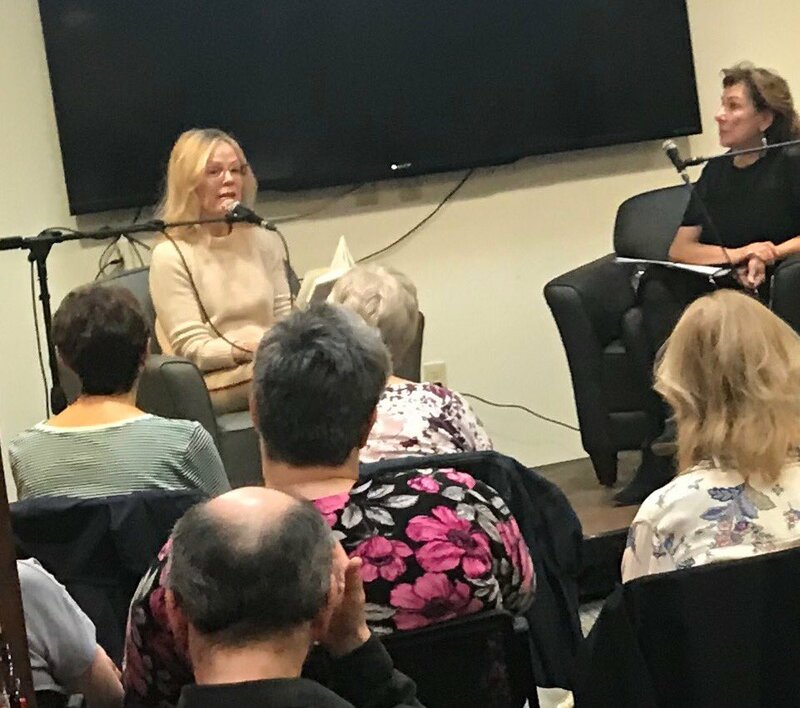 When a member of my family was seriously ill and I was worried about our treatment options, I emailed Rick to see if he knew with whom I might speak at Yale. I was surprised to get a response almost immediately, and he followed up after I had talked with the people he’d recommended. The doctors with whom we met proved to be both impressively knowledgeable and wonderfully humane. That’s what one wants, isn’t it, from a doctor, a professor or a university president. From where I sit, it’s the sweet spot of academic leadership: knowledge and humanity. Rick Levin has hit that spot more than most over the past 20 years. I’m grateful and wish him well. Thanks to Mark Masselli (Hon ’09, P ’15, P’16), Community Health Center and a group of dedicated sponsors (Wesleyan included), there is going to be a great new tradition starting in Middletown on December 31st. Midnight on Main promises to be a great family-friendly event starting at 3 PM and ending with tolling of the bells as the year turns. There are more than a 100 events up and down Main Street. A fireworks extravaganza is planned for 6 PM. For more information about Midnight on Main, check out this website. 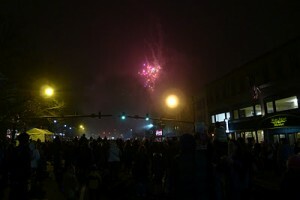 It was great to see the happy crowds wandering around Main Street around the time of the stupendous fireworks display. All the restaurants were filling up, as were the many shows that were attracting folks from all over Central Connecticut. As I walked back up Washington Street to campus, I saw smiling groups emerging from Kidcity Children’s Museum. I was reminded of the museum’s founding director Jennifer Alexander’s (‘ 88, Hon ’09, P ’15, P’16) important work here in Middletown for over 20 years. It was wonderful to see Mark’s and Jen’s vision for Midnight on Main turn into such a successful even last night. Happy New Year!! I recently signed the Berlin Declaration on Open Access to Knowledge in the Sciences and Humanities. The Declaration was initiated in 2003 by the Max Planck Society in Munich, Germany, to support the open dissemination of knowledge throughout the scholarly community. Over 300 colleges and universities have signed the Declaration since then, and Wesleyan is one of a small but distinguished group of U.S. institutions to do so. The impetus behind the open access movement comes from the opportunities afforded by the Internet for the dissemination of scholarly publications and from the severe challenge posed by the soaring prices for many academic journals. We want to encourage access to the latest research. At Wesleyan, we have used WesScholar as a vehicle for sharing the work of our faculty. Signing the Berlin Declaration is another step for encouraging increased access to advanced research. Now that Wesleyan has declared its support for open access to scholarship, what do we do next? One step that has been taken by the faculties of Harvard, MIT, Bucknell, Oberlin College and others is to pass a formal resolution to publish in open access journals, or journals that permit open access to articles via an institutional repository. Because of the complex issues surrounding academic publishing as well as promotion and tenure practices, these resolutions were preceded by thorough on-campus discussions of the issues and how they might be addressed to the satisfaction of faculty members at all stages in their careers. The week of Oct. 24-30 is Open Access Week, a perfect time to begin this conversation at Wesleyan. Pat Tully, University Librarian, will post on her blog a series of entries about open access issues, which can be used as the basis for a series of campus discussions this year led by faculty, students and anyone interested in making scholarship more accessible. 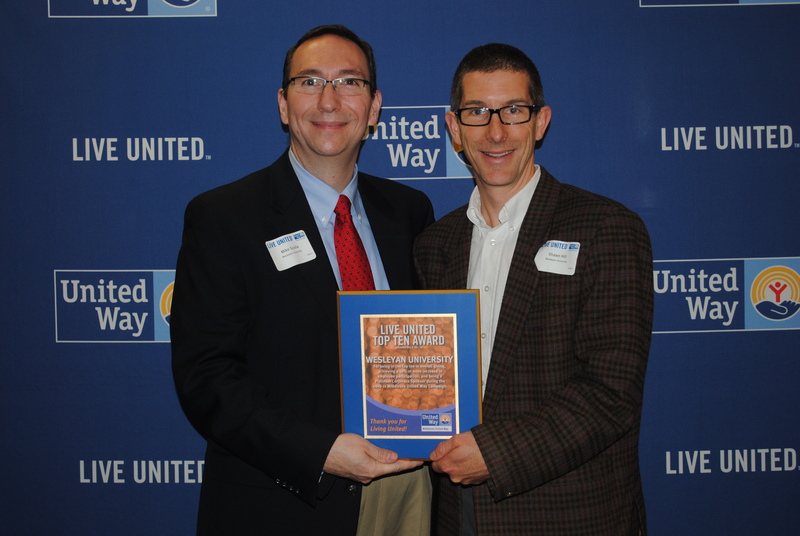 This week I attended the Middlesex United Way Award breakfast at which Wesleyan received recognition for its very effective efforts to raise money on behalf of some crucial community programs. 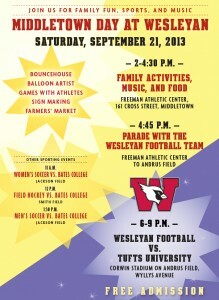 As a Platinum Level Sponsor of its 2010-2011 Campaign, Wesleyan was one of the top ten accounts in the organization. We also were recognized for the sharp growth in our level of participation, and our overall dollar amount. 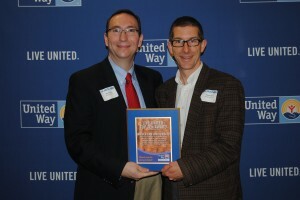 As one of the tri-chairs of this year’s campaign, I was proud to receive a Leadership Award from Kevin Wilhelm. The real work, though, was accomplished by the Wesleyan volunteers, led by Shawn Hill and Mike Sciola, who inspired generous donations from across the community. Thanks to all who support this important work! This morning I met with some of our state legislators to talk about topics of importance for higher education. Wesleyan is a member of the Connecticut Conference of Independent Colleges, and our sector provides significant opportunities for students across the state. About a third of Connecticut undergraduates attend not-for-profit private colleges and universities, but we award about half of the degrees in the state. The students we enroll are much more likely to graduate! An educated workforce is one of our state’s great resources, and our sector is a large contributor to this environment. One of the issues we are most concerned with these days is cut to the state’s support for students with financial need — the CICS program. Connecticut residents have been eligible for grants at private institutions, and for many this support has been crucial. Governor Malloy has deep fiscal challenges to meet, and I have a great deal of respect for his efforts to visit citizens throughout the state to hear their responses to his budget plans. He has rightly noted that all citizens will have to sacrifice in order to put Connecticut back on the right economic track. Unfortunately, the plans announced for CICS go beyond shared sacrifice. In just a few years they would decimate the program on which so many of our students depend. About 14% would be cut next year, and the proposal is to cut 50% in year two! That’s just taking a hatchet to a very successful program. We need a scalpel. We have been making our case in Hartford, and this morning we made it again at breakfast. Support for higher education in Connecticut is a crucial investment in our long-term economic health, and helping state residents stay close to home to complete their degrees makes a lot of sense. I am hopeful that the governor and our state legislators will find a way to preserve more of the financial aid going to undergraduates. This aid pays real dividends in the long run by promoting excellence in Connecticut. Speaking of excellence in CT: Congratulations to the Huskies on an amazing run to the National Championship! But it does certainly mean we can start thinking of warmer times. For example, I just noticed that the winter silent auction to raise money for the Green Street Art Center has been postponed until April 8. It’s just been too hard to get around, and the staff thought we’d be safer planning our celebration of the great work of the GSAC in the spring. But the online auction is still on for another week to raise money for Wesleyan’s wonderful civic engagement initiative in Middletown. The online auction officially closes Sunday, February 13th! Please encourage anyone you know to check it out and help us raise money for our students! Visit our online auction. Kari and I are auctioning off a dinner at the President’s House (she’s a great cook and a better dinner partner; I’m a pretty good dishwasher), and if people don’t bid soon my mother is likely to get it! PLEASE HELP!!! This is also the time that students can register for Wesleyan’s Summer Session. Between now and March 31, students can sign up for these intensive classes in the first part of the summer. You can take Foreign Policy at the Movies with Douglas Foyle, or travel to the Gulf Coast with Barry Chernoff to investigate the Deepwater Horizon tragedy. You can also make progress on general education expectations or try playing Gamelan. Check out the offerings. It’s still winter, but it helps to think of some of the good things to come in spring and summer!